When reviewing your surveillance footage, have you ever wondered what the people in the video are saying? If you install an audio camera, you would no longer have to wonder. 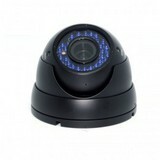 Audio cameras are security cameras with built-in microphones. The added audio aspect to video footage greatly enhances surveillance systems. When pictures are unclear, or individuals are just out of viewing range, the audio can help identify the person(s). When installing an audio camera, it is important to consider the connections required for audio input. Be sure that your DVR is able to support the audio feature, or you may be inclined to take advantage of RCA connectors or AV (audio & video) cables. These options may limit confusion as less excess equipment is required. Another crucial aspect is the fact that people must be informed that audio security cameras are being employed. It must be explicitly stated so that people are aware that they are being recorded, both visually and audibly. It is likely that you have seen these signs in various stores or banks stating that you are being monitored. This warning could very well prevent a crime from happening as criminals will fear being caught. Find the right audio security camera for you! Still, there is controversy over the invasive nature of audio security cameras, as well as security cameras in general, especially in public places. While there are laws to regulate audio security camera use, people still believe it is a gross invasion of privacy. On the other hand, audio security cameras can be extremely helpful when catching criminals or thieves. Video surveillance with an audio component can provide compelling evidence when convicting a criminal. Use of audio cameras within your security system is solely up to you. Weighing options will help you decide whether audio security cameras are right for your system. If you need any assistance, visit us at SecurityCamExpert.com or give us a call at 1-888-203-6294.